President Trump signed CRA resolution into law, reversing oil and gas reporting rule. It’s the first time in 16 years the Congressional Review Act’s been used to repeal a regulation. House and Senate both passed more CRA resolutions related to guns, land, labor, and healthcare. Plenty of famous faces on the Hill from foreign leaders to Fed chair, astronaut to actor. House Republicans presented most detailed look yet at their plan to repeal and replace Obamacare. Michael Flynn stepped down as national security adviser. Senate confirmed five more nominees. White House decided to rescind travel ban executive order and issue a new one next week. Trump administration’s first major regulation opened for public comment. Four more nominees are teed up for final votes, following next week’s recess. President Trump signed Huizenga res into law, disapproving of oil and gas reporting rule. You've probably seen it referenced as the "resource extraction" rule, and it required oil, gas, and mining companies to report payments they made to federal and foreign governments to the Securities and Exchange Commission (SEC). This is the first time in 16 years the Congressional Review Act has been used to repeal a regulation. So at this point, you understand the Congressional Review Act (CRA) and how Congress has been using it these past few weeks. This week the House passed five resolutions focused on rules issued by Labor, Interior, and Health and Human Services (HHS). This week Senate passed Johnson res disapproving of a rule that required the Social Security Administration to report beneficiaries deemed mentally incapable of managing their benefits to the national background check system. Some opponents of the rule said that it adversely impacted Social Security beneficiaries' Second Amendment rights without due process, while some mental health and civil liberties groups objected to the standard it established for determining mental incapacity. Proponents of the rule say that it is a common sense measure to keep guns out of the hands of those who are mentally unstable. The bill passed the House earlier this month, meaning now it heads to President Trump for his signature. See how your representative and senators voted on this resolution! So many famous faces in Washington this week! President Trump hosted Canadian Prime Minister Justin Trudeau and discussed defense and trade policies. Then Israeli Prime Minister Benjamin Netanyahu met with both President Trump and bipartisan group of House leaders. Federal Reserve Chair Janet Yellen delivered semiannual monetary policy report, testifying before both Senate Banking and House Financial Services. Read the full monetary policy report. Staffers were a-buzz seeing Ashton Kutcher on the Hill, who delivered emotional testimony about human trafficking and sexually exploited children. Kutcher is the co-founder of Thorne, an organization that builds software to fight human trafficking. The next day former astronaut and senator Harrison Schmitt testified before House Science, Space, and Technology regarding space exploration funds. Schmitt was on the Apollo 17 mission and served one term in the Senate. It was a busy first week on the job for HHS Secretary Tom Price, who was sworn in last Friday. On Tuesday, the Centers for Medicare and Medicaid Services (CMS) released the first major proposed rule change of the Trump administration, impacting health exchanges and requirements on insurers under the ACA. In Congress, House members staked out positions on ACA repeal, with the House Freedom Caucus voting to oppose any repeal bill that does not go as far as the measure passed in 2015. Congressional Republicans are divided over whether to repeal Obamacare's taxes. Republicans are also considering capping tax break on job-provided health insurance in order to finance Obamacare replacement. On Thursday, House Republican leaders presented the most detailed look yet at their plan to repeal and replace Obamacare. Though Senate Republicans may be tough to sell on the plan, with some calling parts of it “unacceptable.” Despite reports from Congress, the president says things are “moving fast,” and he expects to finalize a plan in the first week of March for Secretary Price to “quarterback” through the House and Senate. 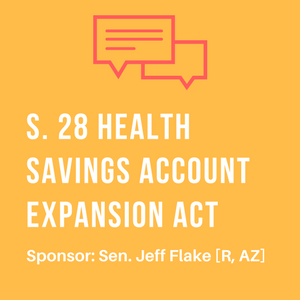 Yesterday Sen. Jeff Flake [R, AZ] and Rep. Dave Brat [R, VA-7] met with National Economic Council Director Gary Cohn at the White House to discuss health savings accounts (HSAs). 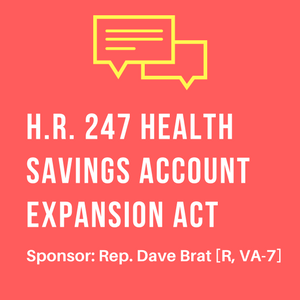 Both lawmakers introduced legislation last month that would nearly triple contribution limits to HSAs and allow for more universal participation. Health savings accounts are widely discussed in the plans to replace the Affordable Care Act (Obamacare). Michael Flynn resigned as national security adviser after reports he misled White House officials about his conversations with Russia. His 24-day tenure was the shortest in history for a national security adviser. The Department of Justice reportedly warned the White House about Flynn's communications with Russia back in January, under the direction of then acting attorney general Sally Yates, who feared Flynn could be vulnerable to Russian blackmail attempts. The president told reporters he had no problem with the calls to Russia, but that Flynn's misrepresentations to Vice President Pence were "unacceptable." Bipartisan senators are seeking a full briefing and transcript of the Flynn calls. House Oversight and Government Reform Chair Jason Chaffetz said the committee will not investigate Flynn but will investigate the leaks within the administration that led to the information becoming public. Senate Minority Leader Chuck Schumer called for an independent, outside investigation. A current intelligence official who has seen the transcript told NPR that he or she did not see evidence of criminal wrongdoing. President Trump named retired Lt. Gen. Keith Kellogg as acting national security adviser. Robert Harward, former CENTCOM commander under Defense Secretary James Mattis, turned down President Trump's offer to serve in the role permanently. This week the Senate confirmed five more cabinet and agency nominees, bringing the total to 14 confirmed Trump nominees. 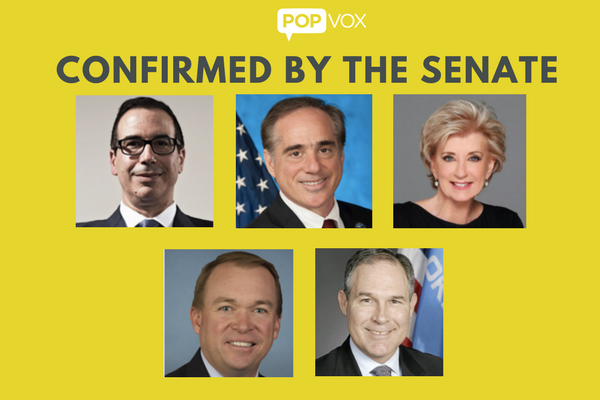 On Monday, Senate confirmed Steven Mnuchin as Secretary of the Treasury by a vote of 53-47 and then moved to confirm David Shulkin as Secretary of Veterans Affairs unanimously. On Tuesday the Senate confirmed Linda McMahon as administrator of the Small Business Administration (SBA). The final vote was 81-19. Mick Mulvaney was later confirmed as Office of Management and Budget (OMB) Director by a vote of 51-49. Sen. John McCain [R, AZ] was the only Republican to vote against the nomination, citing concerns over defense spending. Senate stayed in session overnight last night, with Senate Democrats expressing concerns about Pruitt's nomination for administrator of the EPA (Environmental Protection Agency). This afternoon Senate confirmed the nomination by a vote of 52-46. Sen. Susan Collins [R, ME] was the only Republican to oppose the nomination, referencing Pruitt's 14 lawsuits against the EPA. Sens. Joe Manchin [D, WV] and Heidi Heitkamp [D, ND] were the only Democrats to support the nomination. Sens. John McCain [R, AZ] and Joe Donnelly [D, IN] abstained from voting. This week judges and attorneys general across the country continued to weigh in on the travel ban executive order. Federal judge halted the travel ban for Virginia residents, as well as students or employees of public universities in Virginia. Maryland lawmakers gave state Attorney General Brian Frosh the authority to sue the federal government over the travel ban, after Gov. Larry Hogan [R] was reluctant to give permission. Meanwhile, Texas became the first state to back the temporary travel ban in court by submitting an amicus brief in support of the federal government. Ultimately, federal judge in Seattle denied request to delay court proceedings on the travel ban. Department of Justice (DOJ) told the Ninth Circuit the Trump administration will rescind travel ban executive order and issue a revised one next week. We'll continue to keep you posted and give you tools to write your lawmakers! 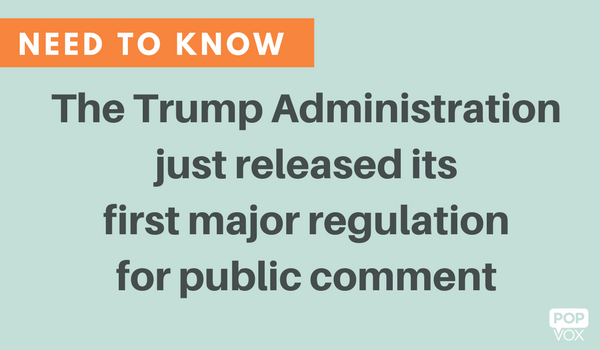 Today the Trump administration's first major regulation opened for public comment. Great! What's that mean? Well, regulations are "in the weeds" rules for implementing a law. Congress passes laws that set the parameters of a new policy, but the executive branch must decide and explain how it will carry out those laws. Remember, when you hear executive don't think solely of the president, think of the hundreds of agencies that execute policy. Any time the executive branch wants to change or issue a new regulation, it has to notify the public, explain why it is suggesting the change, and provide opportunities for people to provide input on the change. Think of this as civic engagement for the super pros. The first major Trump administration rule was published in the Federal Register and will be open for public comment until March 7, 2017. The 71-page rule contains the first administrative changes that the Centers for Medicare and Medicaid Services (CMS) propose for the Affordable Care Act (Obamacare), including reducing the open enrollment period, allowing insurers to collect back payments on unpaid premiums, and granting states the ability to decide whether the allowed network of providers is sufficient. Read the final rule and learn how you can participate during the public comment period. These nominees are next to be considered by the full Senate. Be sure to share your thoughts with your senators before the final votes! Two confirmation hearings in the books — Centers for Medicare and Medicaid Services (CMS) administrator nominee Seema Verma testified before Senate Finance, and President Trump's pick for Israel ambassador David Friedman testified before Senate Foreign Relations. Supreme Court nominee Neil Gorsuch submitted questionnaire to Senate Judiciary, and committee scheduled confirmation hearing to begin March 20. Be sure to write your senators! Marathon Pharmaceuticals will delay commercialization of newly-approved treatment following questions from Sen. Bernie Sanders [I, VT] and Rep. Elijah Cummings [D, MD-7]. Joint Economic Committee Republicans discussed valentine's spending. House Energy and Commerce Republicans asked agencies to submit accounting plans on how to cut costs. House Natural Resources produced the best Hill valentines. Senate Finance Chair Orrin Hatch discussed H-1B visa program with President Trump. When the White House website and Federal Register don't match. FAA is investigating another Harrison Ford aviation mishap. State Dept. exempted diplomats from hiring freeze. Congress set to take up self-driving cars legislation. House Republicans are considering Medicaid reforms for reconciliation bill. Rep. Mike Bishop [R, MI-8] is now on Ways and Means. Senate Commerce Chair John Thune is drafting legislation to codify net neutrality principles into law rather than waiting on the FCC to roll back its 2015 open internet order. President Trump plans to appoint Stephen Feinberg, co-founder of Cerberus Capital Management, to lead a review of U.S. intelligence agencies. Sen. Jeff Flake [R, AZ] is looking to roll back FCC rules governing broadband privacy using the CRA. DHS considered a draft proposal to authorize National Guard troops to perform the functions of immigration officers. White House Press Secretary Sean Spicer said he couldn't say the idea was never discussed but confirmed there is no effort to execute the proposal. No more double duty for Spicer — White House selected Mike Dubke as communications director. Layoffs at the State Dept. Trump administration sanctioned Venezuela's new vice president. Mexican immigrant covered by DACA is being detained by immigration officials, reportedly the first Dreamer to be arrested during Trump presidency. Twelve current and former TSA agents and airport employees were indicted by a federal grand jury for their alleged involvement in cocaine smuggling ring. Immigration and Customs Enforcement (ICE) confirmed that more than 680 undocumented immigrants were arrested last week during routine raids. NY Gov. Andrew Cuomo [D] signed a bill imposing a one-year moratorium on NYC's plastic bag fee, hours before the fee was set to take effect. Two Native American tribes submitted new court filing to stop the Dakota Access pipeline. District judge denied previous filing, which made an argument on religious grounds. New filing cites alleged violations of NEPA, APA, and other statutes. National Weather Service suffered major outage. Oklahoma House committee advanced bill to require men's permission for abortions. In Oregon, you can now order legal marijuana and have it delivered. Kentucky House passed "Blue Lives Matter" bill that would make it a hate crime to target police and first responders. ADVOCACY Q&A: How do you run an effective digital advocacy campaign?